Jan. 23, 2013 11:00 a.m.
Jeff Gibbons, the President of the Millet Fish & Game Assoc. 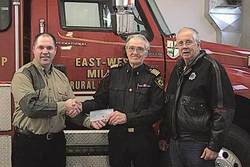 (on left) presented a cheque for $2,500.00 to Al Kilborn (center) and Al Hegge (on right) from the Millet Fire Department to assist the department with their fundraising efforts to purchase a Thermal Imaging Camera. A large group of people including Leduc County Mayor John Whaley (second from right), Minister of Agriculture and Agri-Food Gerry Ritz (center with gray jacket) and MP James Rajotte (sixth from left) met at the Leduc Chamber of Commerce with representatives from the agriculture industry to hold a round table discussion about the agriculture industry. Playwright and actor Julia Mackey from Jake's Gift (on left) presents representatives from the leduc Legion with a gift of a print created by a Canadian artist that is raising funds for the Canadian Fallen Heroes Foundation.